You’ve like seen it for years: “friends” using Facebook as their own personal garage sale to persuade you and others to purchase their belongings, apartments, cars, and other items on Facebook. Now, instead of seeing those posts littering your news feed, or in area “buy, sell, or trade” groups, the social media giant has created its own dedicated Craigslist clone, dubbed Marketplace. Facebook launched Marketplace in the U.S., U.K, Australia, and New Zealand on its mobile app Monday, creating an alternative area for the more than 450 million people who visit buy and sell groups each month on the site. Unlike those sites, which are often dedicated to a user’s geographical location, Marketplace does not require that a prospective buyer or seller receive approval from a group moderator. Marketplace can be launched by tapping on the shop icon at the bottom of Facebook’s app. From there, users can search for specific items and filter results by their location, cost, or category. Once a desired product is found, users tap on the photo for additional details, including product description, the name and profile photo of the seller, and their general location. Item can also be saved to easily find it later. To purchase an item listed on Marketplace, buyers send a direct message to the seller and make an offer. From there, the buyer and seller work out their own sale, as Facebook notes that it does not facilitate the payment or delivery of the items listed in Marketplace. Posting items for sale is just as easy, Facebook notes. Sellers simply take a photo of the item, enter a description and price, confirm the location and select a category, and then post. 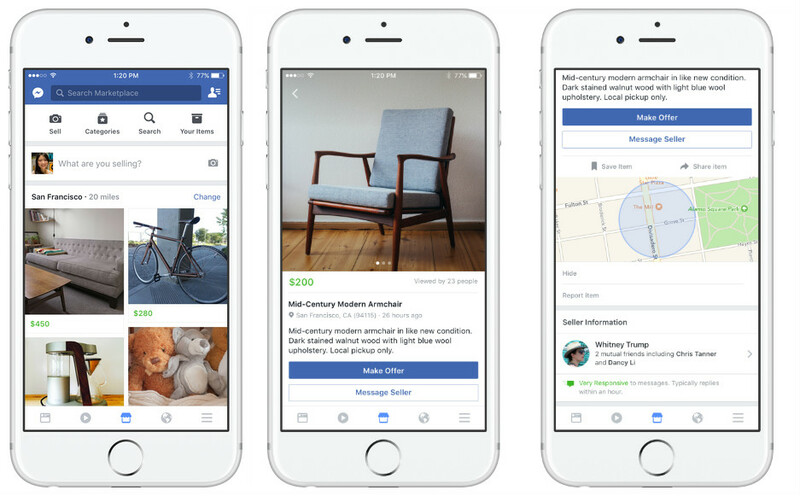 To reach more prospective buyers, Facebook allows sellers to post their times to Marketplace and specific buy and sell groups at the same time.